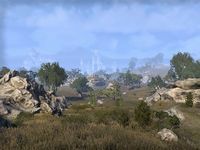 The Gold Coast is a region situated in western Colovia, between Hammerfell and Malabal Tor. During Varen's Rebellion, a rough stone wall was built along the region's border with the Colovian Highlands to protect the cities of Kvatch and Anvil from retaliation by the Longhouse Emperors. The wall has since played a major part in keeping the region protected from the fallout of the Alliance War which is raging across the rest of Cyrodiil. The Gold Coast is a DLC zone added by the Dark Brotherhood DLC. The zone also contains an entrance to the Depths of Malatar group dungeon, but the Wrathstone DLC is needed in order to access it. For Dark Brotherhood faction quests, please see Dark Brotherhood Quests. The Gold Coast previously appeared in Oblivion. Nodes in the zone have a chance of containing a Grain of Pearl Sand, while minotaurs killed in the region may drop Oxblood Fungus Spores. This zone is called "The Gold Coast" in your journal. This page was last modified on 3 March 2019, at 00:33.